Property 8: COUNTRY HOUSE WITH POOL. 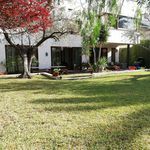 Villa heated ideal for rest and visit Seville, with swimming pool. Property 10: Villa heated ideal for rest and visit Seville, with swimming pool. Villa with garden and pool 10 minutes from Seville. 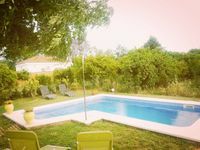 Property 17: Villa with garden and pool 10 minutes from Seville. Ideal villa for rest in family, visit Seville and Andalusia. Property 24: Ideal villa for rest in family, visit Seville and Andalusia. Unique house for 12 people with fantastic terrace in the center of Seville. Property 26: Unique house for 12 people with fantastic terrace in the center of Seville. Wonderful week in Seville - even better house. We are not long back from our trip to this wonderful house, and already wish that we could return. We flew into Seville airport, and it was refreshing to only have to spend around 10-15 minutes in the car before getting to the property. We were treated to a very thorough and informative show around the house by Victoria and then left to our own devices for a week! The house has everything that you could possibly need to stay for any length of time. The WIFI works well, even outside, and the Air Con (which is necessary for a little before bed-time during the summer) is a nice relief. All kitchen equipment is there and seems almost new. The real highlights of the property for us were the lovely pool, and the different seating areas around the house which let you either stay in or out of the sun at any time. We had many great trips during the day, to Jerez, Cadiz, Carmona and a few others, as well as Seville of course. The trips to these cities are made much easier by the short distance to the motorways, although you are far enough away to avoid any noise from either the motorway or the airport. All in all this is one of the best places that we have stayed, in Spain or elsewhere, and would highly recommend it to anyone. First class property with superb facilities, matched by Ignacio, our first class property manager. He was always ready to help wherever possible. The property is in a great location just 20 mns from Seville centre...ideal for a family looking for a relaxing holiday but close enough to see the sites of this amazing city.